The Munar Excursion Module (M.E.M.) 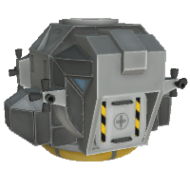 is a Command Module housing two Kerbal crew members during their mission. The M.E.M. is based off of the Lunar Excursion Module. Generally placed at the top of the rocket as part of a lander, the Munar Excursion Module provides full command module functionality. The Munar Excursion Module is outfitted with its own RCS thrusters along with 30 Monopropellant and some fuel. However, unlike most crewed command module, it does not have reaction wheels. “ After hearing pilots refer to their current line of landers as 'easily crushed tin cans', the marketing department decided that what customers really wanted was a lander that resembled an already crushed tin can. The Munar Excursion Module was inspired by the Apollo LEM. This page was last edited on 11 April 2019, at 03:44.